This month sees the launch of ‘La Belle Sauvage’, the first book in the new Philip Pullman trilogy ‘The Book of Dust’. On sale from 19th October, the new publication comes some 22 years after the widely acclaimed ‘Northern Lights’ from His Dark Materials trilogy was published. This new novel is anticipated to drive fans back to re-read the original trilogy as well as introducing Pullman’s magic to a whole new generation of readers. Those inspired by Pullman’s novels who want to immerse themselves in the ‘Northern Lights’ experience still further can visit with independent Scandinavian specialist Best Served Scandinavia. Choose from a host of inspirational holidays across the region including a newly created itinerary to the magical Svalbard landscape or perhaps a more traditional city break in Norway’s Tromso. From snowy peaks to polar bears, the Svalbard wilderness is probably the most iconic setting of Philip Pullman’s trilogy – His Dark Materials. This new itinerary for Pullman aficionados showcases the best of it all with husky sledding trips, a walk through a secret glacier cave and a visit to a wilderness camp in search of the Northern Lights. The dogsledding adventure is along 12km of icy trails onto a glacier where there is a hidden ice cave reflecting the fantasy world of Pullman’s vivid imagination. The itinerary includes a real wilderness experience at the cabins of Camp Barentz in the remote Advent Valley where tales of the island and its polar bears are told around a crackling campfire. There’s an authentic reindeer dinner washed down with cake and fire-brewed coffee is served to ensure guests are alert to keep a lookout for the Northern Lights. Best Served Scandinavia (0207 664 2241, best-served.co.uk) offers a four day Philip Pullman’s Northern Lights break from £1,220 per person including flights, 3 nights’ accommodation at the Radisson Blu Polar Hotel on a bed and breakfast basis, a husky sledding excursion to an ice cave including transfers, expedition lunch and warm clothing and a Northern Lights evening at wilderness camp Barentz including transfers and dinner. This new itinerary is available from 9th January 2018. Unforgettable memories will be made on a five-day break combining the vibrant city of Oslo with the natural beauty of the arctic wilderness of Svalbard. After a day and night in Oslo, head to Svalbard which is one of the best places in the world to glimpse the polar bears that inspired Pullman’s magnificent Iorek Byrnison character. Activities on offer include a polar night safari on a snowcat and dogsledding. Marvel at the Spitsbergen Hotel which formerly provided accommodation for coal miners prior to its comprehensive refurbishment. Set on a hillside just ten minutes’ snowmobile ride from the centre of Longyearbyen, the hotel offers fabulous views over the town and the Lars glacier. Best Served Scandinavia (0207 664 2241, best-served.co.uk) offers a five-day Northern Lights in Svalbard break from £975 per person including flights to Longyearbyen via Oslo, 1 night at the Grand Hotel Oslo on a bed and breakfast basis, 3 nights at the Spitsbergen Hotel on a bed and breakfast basis and a 2 hour Northern Lights excursion by Snowcat. 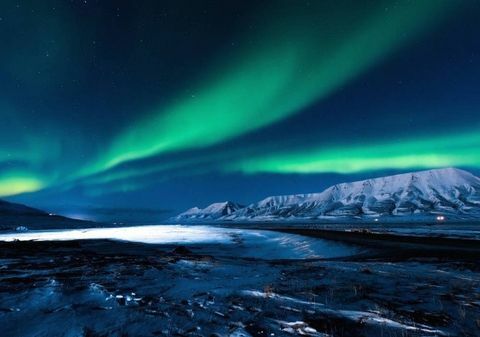 There are Northern Lights itineraries to suit all budgets, and the Norwegian city of Tromso in the centre of the northern aurora zone offers superb value Northern Lights viewing with a direct flight from Gatwick. With a lively street scene, some great museums and art galleries as well as more pubs per capita than anywhere else in Norway, Tromso is the perfect location for a city break with a difference. Best Served Scandinavia (0207 664 2241, best-served.co.uk) offers a four day tailor made city break from £565 per person, including flights, bed and breakfast accommodation and an aurora tour.